This series of articles examines innovation in the Artificial Intelligence (AI) space. Our first post provided an introduction to the Artificial Intelligence startup landscape, our second post reviewed the top trends and companies within the Smart Home Robots category, and our third post reviewed those within the Deep Learning/Machine Learning category. We researched the Artificial Intelligence sector and identified 881 companies with $3.07 B in funding across 13 categories. 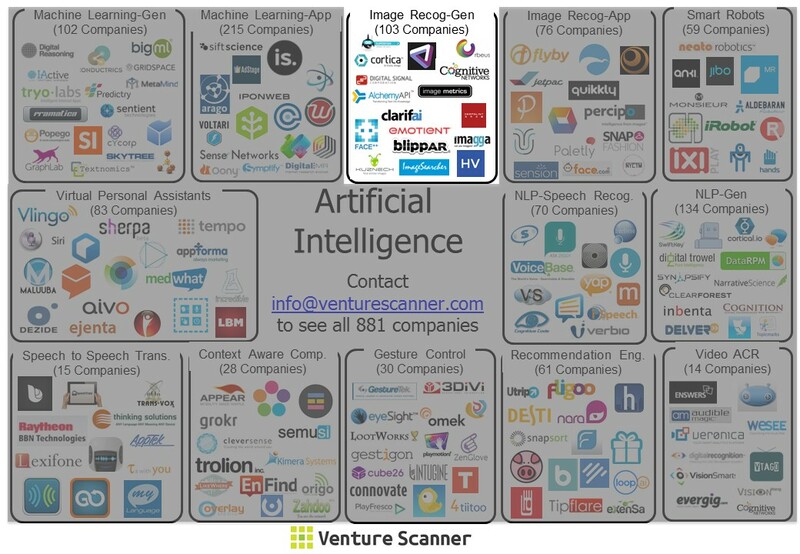 To see the full list of 881 Artificial Intelligence companies, contact us using the form on www.venturescanner.com. This article demonstrates how our technology and analysts can help corporations exhaustively scan for all the relevant companies in a given sector, and provide deep dives into categories of interest to identify the best startups for them to work with. This week we are going to examine the Image Recognition category within the Artificial Intelligence sector, which is comprised of 103 companies with $455M in funding. Image recognition is the method of processing and analyzing images to understand and produce information from them, as well as identifying objects and faces in those images. Multiple Object Recognition: Google researchers have developed a program twice as effective at locating and distinguishing multiple objects of various sizes in a single image, such as identifying different fruits in a fruit plate. Image Description: Teams at Stanford and Google have independently created technologies that are able to recognize and describe entire scenes of photographs and videos in prose with great accuracy. Gesture Recognition: NYU and Facebook AI Lab Director Yann LeCun has built a deep learning model capable of predicting the position of human limbs in images. This could lead to better gesture control and motion capture systems. Facial Recognition: Facebook developed a program called “DeepFace,” which could determine if two faces in photos are the same person with 97.25% accuracy. We have selected a few companies to highlight, based upon our analysts’ evaluations of their traction, technology differentiation, funding amount, and founding team pedigree. Vicarious focuses on image recognition, segmentation, and scene parsing technologies. The company announced it can crack any type of CAPTCHA with at least 90% accuracy. It has raised $72M from notable investors including Vinod Khosla, Elon Musk, Mark Zuckerberg, and Aaron Levie. Clarifai specializes in deep learning algorithms for visual search. It is developing an API for developers to access its image search technology and plans to license its software to corporate users. Its notable investors include Google Ventures, Nvidia, and Qualcomm Ventures. Cortica specializes in deep learning image recognition technology that automatically extracts the core concept in images and videos and maps them to keywords. The company has over 100 patent applications and has raised $37.9M. AlchemyAPI focuses on deep-learning-based text analysis. It also offers deep-learning-based image recognition APIs for face detection/recognition, image tagging, and image link extraction. The company has raised $2M in February 2013. Superfish is building visual search technology focused on consumer applications. It has created 3 visual search mobile apps for animal, furniture, and product recognition. The company has raised $19.3M from notable investors including DFJ.